In deep heavy 3-quart saucepan, heat oil to 350°F. Meanwhile, remove dough from can; do not unroll. Cut dough into 12 (1-inch) slices. Cut each slice in half crosswise to make 24 pieces. Roll each piece into ball; set aside. In small brown paper bag (lunch bag), mix sugar and cinnamon. Carefully place dough balls into hot oil; cook about 30 seconds or until light golden brown. 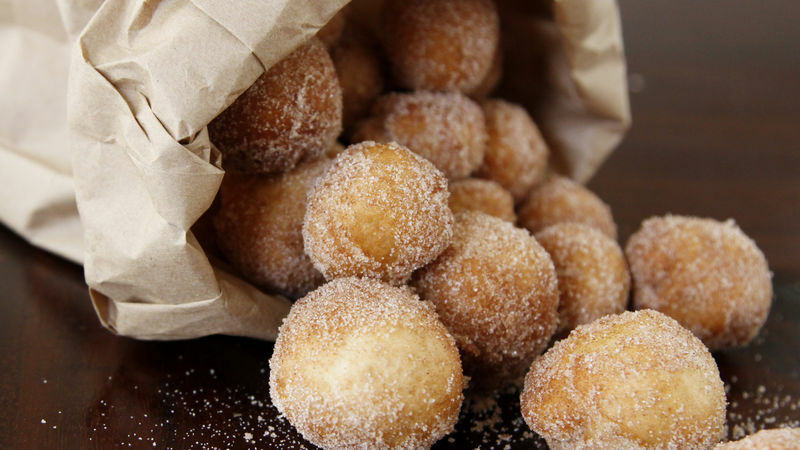 Using wire skimmer or metal slotted spoon, transfer doughnuts to paper bag with sugar-cinnamon. Fold top of bag over; shake until doughnuts are coated. Serve warm. You can use a deep fryer instead of a saucepan. Use a candy/deep fry thermometer to be sure your oil is at the correct temperature.